This picture of Warren Road, St Pauls church on the left, must date from the 1940s. 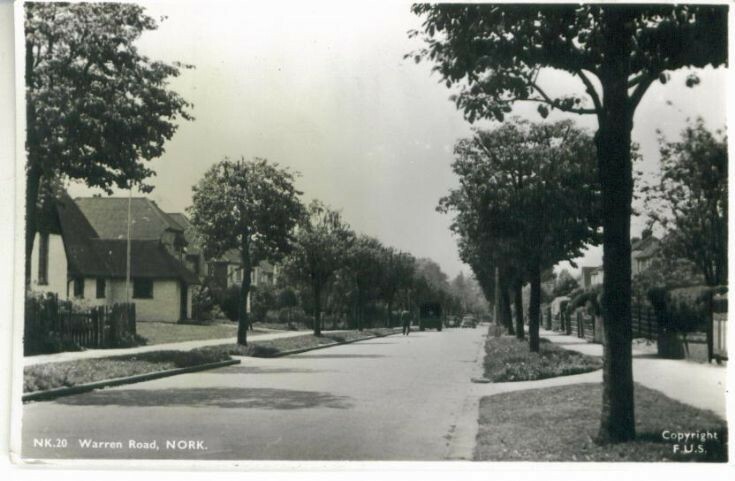 Very interested in the photos of 'bygone Nork' and in the contributions by 'Derek Hoskin'. Could this be the Derek Hoskin with whom I spent many a schoolboy hour during the 1940's, often playing football and cricket in Roundwood Way. ? Even if not, I wonder if you have the photo, in my collection, of the VE Day Children's Party held in St Paul's Church Hall in 1945. ? After reading the above comments, I wonder if anybody remembers my parents, Mr & Mrs Cole, who were some of the first parishoners at St Pauls? They lived in Roundwood Way from 1930 to 1973 I have some photos of when the church was enlarged and reconsecrated in the late 1950s/early 60s. If any one else has stories of the church or Roundwood Way around this time I would love to hear from them. Were the Coles related to the Cole family who owned the fishmongers? We would be delighted to see one or two of the photos you have so do upload them on this site.